Harry Arter hopes his man-of-the-match display against Uruguay was enough to earn him a start on Sunday. 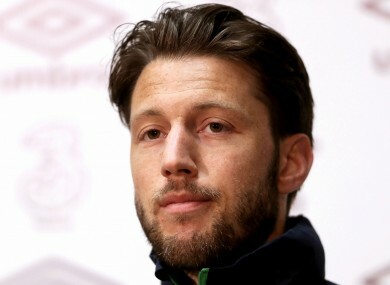 Harry Arter pictured at today's press conference. HARRY ARTER SAYS he is not taking anything for granted ahead of Ireland’s World Cup qualifier at home to Austria on Sunday. The Bournemouth star delivered a man-of-the-match display as Ireland beat Uruguay 3-1 at the weekend and the 27-year-old midfielder was keenly aware that he needed to make a big impression in that game. “I feel individually I need to take every opportunity with both hands,” he says. And does he expect to start, having impressed against the Uruguayans as well as catching the eye in the 1-0 win away to Austria last November? I haven’t really thought about it. Preparation-wise, you’re part of a team. You prepare the same way everyone does, wait for the match day, and the manager to read out the side, and obviously just hope that he names you. “You always want to be playing. I don’t think any player on the bench is ever happy. You have to understand it’s a team game. I’ve been in the game for long enough. The last time Ireland and Austria met, Arter made his competitive debut. After a difficult opening few minutes where he struggled to get to grips with the game, the London-born star emerged with plenty of credit for his overall performance. It was a tad different to what I’d been used to. The build-up to the game was quite similar. You always prepare for big games when you’re at your club. “The atmosphere around the ground was different. The team philosophy here is slightly different. It took a while to get used to. But after 20, 25 minutes personally and as a team, we settled into the game. What also helped Arter improve was an enforced change made during the game. An injury forced Glenn Whelan to depart the action after 22 minutes, with David Meyler coming on in his place. Having begun the match effectively playing a diamond formation with Whelan as the holding midfielder, Arter and Meyler switched to a flat two with James McClean on the left and Jeff Hendrick to the right, coupled with Wes Hoolahan in behind lone striker Jonathan Walters. And while emphasising that he is not particularly fussy about where he plays, the Premier League star admitted the altered system suited his game more. First and foremost, my best role is whatever the manager wants me to do. I’d be prepared to play in any position. “Comfort-wise, I’ve been at Bournemouth for numerous years, we’ve always been playing 4-4-2, just as a two in midfield. (Against Austria) I felt the manager probably realied myself and David are probably not complete sitters and not as much sitters as Glenn, and probably just wanted to balance it off as a two. Moreover, as well as making an impression at international level, Arter had an excellent season for his club, featuring in 35 of Bournemouth’s 38 Premier League games as they secured an impressive ninth-place finish. It’s been an incredible journey for the player, who was lining out with non-league side Woking seven years ago, before becoming part of the Bournemouth side that rose from League One all the way to the top tier. It’s one of those, if you don’t improve with the level you go up to, then ultimately you are not going to play. That’s probably one thing that every player finds when they step up to a new level. “If you’re not quite up to it, you get found out. I’m part of a squad (at Bournemouth) with a great manager behind us who works hard to improve everyone every day, everyone buys into his philosophy, not just myself. I’d like to feel myself, I’ve improved, but it’s pretty obvious from the outside how much individually the whole squad has improved. We finished ninth (in the 2016-17 campaign) and you could see there was a massive progression. The next challenge, of course, is establishing himself at international level playing for a team with a different style and competing in an unfamiliar environment. Every player when they come in, there’s going to be a slight difference to what club football is like and what international football is like. “It must be very tough for the manager here to get over his philosophy and his beliefs because he has only got a few days with the lads and they’re coming from a club where they’re there every day. But one thing I’ll say here, the group of lads here are a great bunch, one that I feel I’ve settled into really well from when I first met up. Email “'That game for me was as big as the Austria one'”. Feedback on “'That game for me was as big as the Austria one'”.